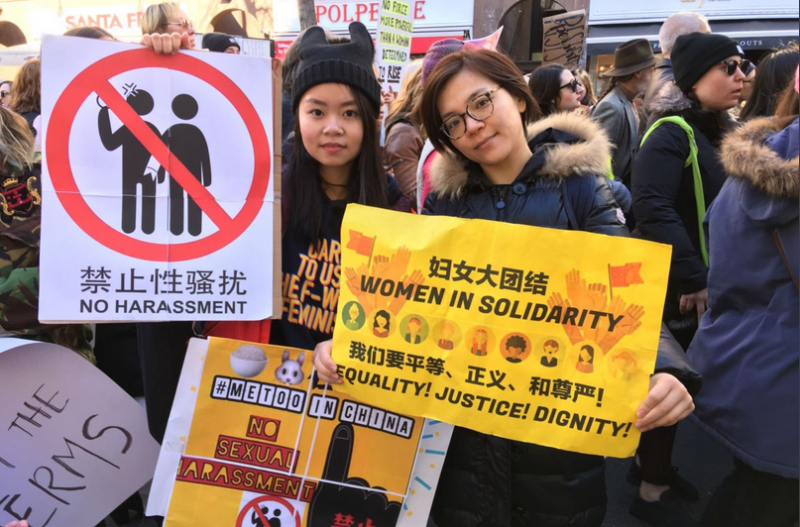 Chinese students displayed anti-sexual harassment banners at the January 20 Women’s March in Washington, DC. Image via Voice of America, licensed for reuse. In 2017, our team at the University of Hong Kong built a technical web “scraping” system for studying censorship on WeChat’s publicly accessible pages. Throughout 2018, we tracked more than 4,000 public accounts covering daily news and preserved censored posts in a publicly accessible database, WeChatscope. This article is the third in a partnership series with Global Voices. The first high-profile #MeToo exposé in China to make international news was reported on Weibo on New Year’s day of 2018 by Luo Xixi, a former student at the Beijing University of Aeronautics and Astronautics. One month later, in early April, the Chinese #MeToo campaign resurfaced when Li Youyou, an alumna of Peking University, published a post accusing Nanjing University literature professor Shen Yang of sexual misconduct against Gao Yan, a fellow classmate of Li’s who died by suicide in 1998. Shen Yang denied the accusation but the school decided to terminate the 60-year-old professor’s contract for “violating teaching ethics”. Coincidentally, Shen is also a Yangtze River Scholar. During this time, a search of Yue Xin on WeChatscope’s database generated zero results. This may have been a sampling error, but more likely it indicates that the term “Yue Xin” was marked as a politically sensitive term and had been completely censored on WeChat’s public domain. The second post, “The resistance and redemption of Gao Yan incident” (高岩事件中的反抗与救赎) is an investigative piece interviewing Gao Yan’s parents and Li Youyou. The report probed into the power relations between teachers and students in a university institution. It was published and also removed on April 8. Despite the clampdown, individual stories about sexual harassment still continue to circulate on social media. According to BBC’s estimation, between June to August 2018, around 30 public figures from education, media and NGO sectors have been accused of sexual violence in China. Though Zhu is closely associated with the China Central Television, public discussion of the case was subjected to less censorship than the Peking University incident. In WeChatscope’s database, we retrieved one censored post, “New development regarding Zhu Jun’s incident. Will people still believe teacher Zhu Jun is innocent?” (朱军事件有了新情况，有多少人还相信朱军老师是清白的？), with a rhetorical question in the headline which may have led readers to believe that Zhu is guilty without any double, and was published and deleted on November 12.